It’s no secret that regular workouts protect your health and make it easier to maintain a healthy weight. But did you know they can also deliver big returns in business? Physical activity stimulates the release of hormones to boost your mood, jumpstart your energy, fight stress and more. Being active in the morning might be particularly beneficial. Research shows that exposure to early morning light can help you feel more awake during the day, as well as improve the quality of your sleep at night. All of these things can add up to increased productivity at work. Below, I've assembled some of the science-backed ways that morning exercise can boost your business success. There are also some simple tips for squeezing in early workouts. - Gives you more energy. You might think that working out would further deplete your energy reserves. But just 20 minutes of low-to-moderate intensity exercise (like walking) performed three times a week can increase energy levels by 20 percent and decrease fatigue by 65 percent, according to a University of Georgia study. Regular activity increases circulation and strengthens your heart muscle, giving you more endurance to power through your busy day. - Boosts your mood. If you’ve ever had a bad day, you know how hard it can be to do your best work. Exercise stimulates the release of endorphins -- chemicals that minimize discomfort and promote feelings of reward and well-being. You’ll start to feel these effects within just five minutes of starting your workout, American Psychological Association experts say. - Acts as a stress-management tool. Exercise doesn’t just increase feel-good endorphins. It also lowers levels of stress hormones like cortisol and adrenaline, helping you feel calmer and more relaxed. And, over time, those benefits could really add up: One animal study found that regular exercise actually reorganizes parts of the brain, making it less reactive to stress. - Sharpens your cognition. Neuroscientists have long known that physical activity fights inflammation in the brain and stimulates the growth of fresh neurons. That could be why parts of the brain related to thinking and memory are larger in people who exercise regularly compared to those who don’t, say Harvard Health experts. Exercise can increase your productivity in several of different ways. And, for a number of reasons, morning workouts may be even more effective. - You’ll skip fewer workouts. Exercise’s positive effects are cumulative -- you need to work out consistently to maintain the benefits. It’s common for projects, meetings and impromptu social invitations to steer afternoon or evening workout plans off course. But when you exercise in the morning, there are fewer distractions to dodge. - You’ll feel more awake. Exercise can’t replace a good night’s sleep. But the circulation and endorphin boosts that come with a workout can help you get going in the morning. 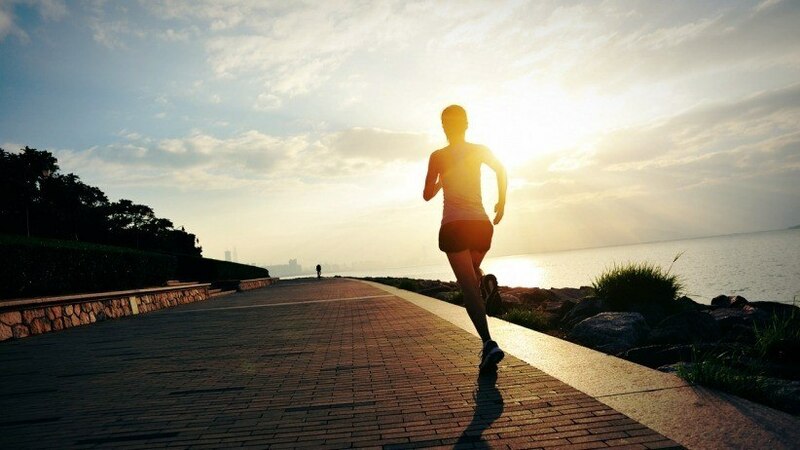 That’s especially true if you take your activity outside, since exposure to morning light promotes wakefulness and boosts cognitive performance, according to a Swiss study. - You’ll have an easier time sleeping at night. Regular exercisers tend to sleep better compared to those who are sedentary. And findings suggest that moving in the morning could be especially beneficial: People who exercise at 7 a.m. spend 75 percent more time in the deepest stages of sleep than those who exercise in the afternoon or evening, according to a Journal of Strength and Conditioning Research study. When business is your top priority, you may be tempted to start your day by diving straight into work. So, try taking a two-week exercise challenge, and see whether you notice a difference in your productivity, mood and stress levels. These simple tips can help you get started. - Exercise first thing. Get moving before you check your email or start reviewing notes from yesterday’s meeting. That way, no matter how hectic things get, your workout won’t get thrown off track. - Make it a priority. You wouldn’t cancel on a client or ignore a deadline, so treat workouts the same way. Block out time. And put them on your calendar, if you have to. - Eliminate barriers. Lay out your workout clothes and sneakers the night before, for instance. If you opt to go to a gym, find one that’s on the way to work. - Reward yourself. Treat yourself to a fresh-pressed juice or a hot bath after your workout. Before long, you’ll start to associate exercise with your reward, which can help cement your new morning routine.